BlackBerry Bold 9930 now available at Verizon | BlackBerry Blast! 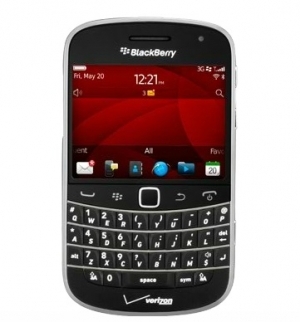 The BlackBerry Bold 9930 is now available from Verizon Wireless for $249.99 on contract. Yep, you got that right, $249.99. Verizon is the first carrier to offer the new Bold Touch, but they won't be the last. Sprint will reportedly launch the same device next week at the same price. What do you think? Is the new BlackBerry Bold Touch worth $249.99 on contract when you can pick up an iPhone 4 on contract for $199.99? BASKING RIDGE, N.J. � Verizon Wireless today announced the new BlackBerry� Bold� 9930 smartphone is available online at www.verizonwireless.com and will be available in Verizon Wireless Communications Stores on August 25. The BlackBerry Bold 9930 smartphone is the thinnest BlackBerry smartphone yet, measuring only 10.5 mm, and is the first BlackBerry Bold to integrate a touch display with a BlackBerry keyboard. This smartphone is performance driven and powered by the new BlackBerry� 7 operating system to deliver the ultimate in communication, multimedia and productivity for Verizon Wireless customers. � Next generation BlackBerry browser has optimized zooming and panning for smoother Web navigation and optimized HTML5 performance. � Premium version of Documents To Go is now included at no additional cost, offering customers enhanced document editing features, as well as a native PDF document viewer. � The newest release of BBM� (BlackBerry Messenger) now offers the real-time BBM experience together with a range of apps including gaming and social networking. � Liquid Graphics� technology combines a dedicated high-performance graphics processor with a blazingly fast CPU and stunning high-resolution display to deliver a responsive touch interface with incredibly fast and smooth graphics. � Updated Social Feeds app has been extended to capture updates from media, podcasts and more all in one consolidated view. � Universal search capability now supports voice-activated search, allowing customers to simply say what they want to find on their device or the Web. � BlackBerry� Balance is integrated in BlackBerry 7, allowing customers to enjoy the full BlackBerry smartphone experience for both work and personal use. BlackBerry Balance allows secure access to business information while preventing the information from being copied into, sent from, or used by personal applications. An administrator can also remotely wipe business information from the device while leaving personal information intact. � BlackBerry� Bold� 9930 smartphone is available for $249.99 with a new two-year customer agreement. � Customers that purchase a BlackBerry� Bold� 9930 smartphone will need to subscribe to a Verizon Wireless Nationwide Talk plan beginning at $39.99 for monthly access and a smartphone data package starting at $30 monthly access for 2 GB of data.